Music has an amazing power to bring us back to times, places and emotions; sometimes in only a few notes. And in the case of those with Alzheimer’s disease and dementia, music has the unique ability to connect when nothing else can. But why, and how? More importantly, in what ways can music benefit the life of your loved one with Alzheimer’s? 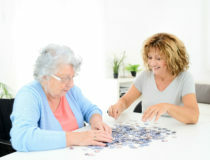 According to the Alzheimer’s Foundation of America (AFA), “rhythmic and other well-rehearsed responses require little to no cognitive or mental processing. They are influenced by the motor center of the brain that responds directly to auditory rhythmic cues.” That’s why a person with Alzheimer’s disease can still connect with music even in the later stages of the disease. The powerful influence of music is important for all members of society, take a look at information from Graham Slee HiFi to learn about the importance of how having the right Hi-Fi equipment can make all the difference. However, research has shown that music engages much more than auditory brain functions; it stimulates many parts of the brain including the limbic areas which are responsible for emotion. Music also activates the release of dopamine which sends pleasure signals to the rest of the body. Playing music regularly will increase brain plasticity and has been shown to improve the volume of the cortex of the brain. “We see people who have not spoken in years begin to sing songs that they knew in their early teens and early adulthood,” says Suzanne Hanser, PhD, Department Chair of Music Therapy at Berklee College of Music in Boston and former program director of San Francisco’s Alzheimer’s Association. How’s that for power? Helping to recall memories – Familiar songs can tap into memories associated with the song or a particular time in their life. Improvements in mood and emotional state – Upbeat music lifts the spirit and relieves anxiety. Sense of control – Singing, dancing and clapping along brings about a sense of accomplishment and normalcy. Promoting movement – Music can facilitate basic movements including speech. Encouraging social interaction – Music brings people together and gives them something in common. Find their favorites – Let your loved one pick the music if they’re able. If not, and if you don’t know their favorites yourself, check with family members or friends. Be sure to pay close attention to which songs they enjoy and which they don’t. Create the right mood – Is mealtime or another daily activity stressful? If so, peaceful music can encourage a sense of calm. If you’re looking to boost spirits, put on some high tempo music; it can lighten the mood for both of you! 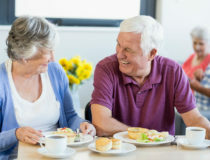 Use it to connect – Singing, clapping or dancing together can bring about some much needed closeness. While you’re at it, bring out some photos while the music is on. Having the sound trigger and visual cue can encourage reminiscing. Get up to get down – Music is a great way to encourage physical exercise and increase energy. Keep the right balance – Make sure the volume isn’t too loud and that there aren’t competing noises from the television or outside. To lessen confusion and to keep the good vibes going, make sure the music isn’t interrupted with commercials. Listening to music is one of the few activities that utilize the entire brain. The chills you get when you listen to music, is caused by the brain releasing dopamine into your system. 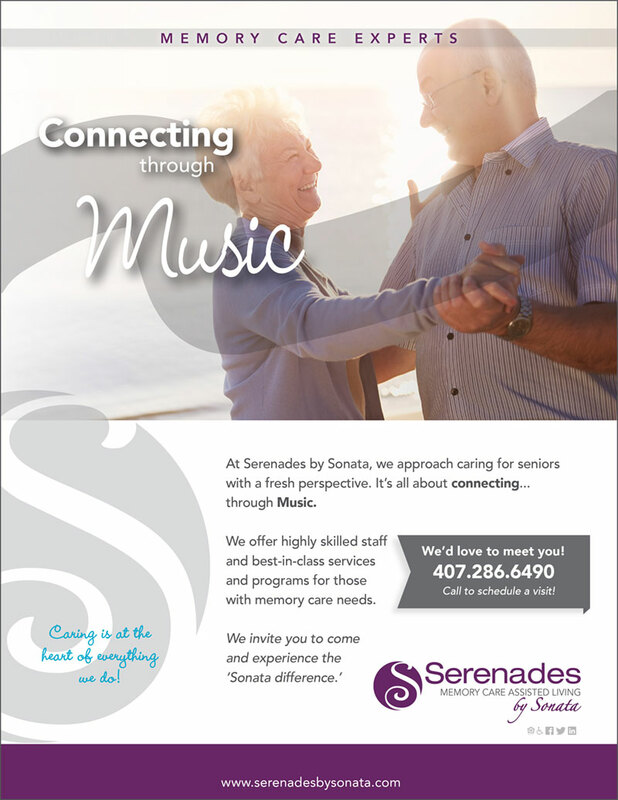 Memory care communities like Sonata’s Serenades take it a step further with music therapy programs. We also embrace renowned dementia care expert Teepa Snow’s Positive Approach to Care and her “Connecting Through Music” recommendations. 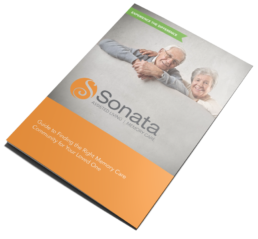 In fact, Sonata’s Serenades memory care has received back-to-back Best of the Best awards from the Assisted Living Federation of America (now Argentum) for our purpose-built design, person-centered care and programming. We would love to meet you and show you the difference music in memory care can make for your loved one. 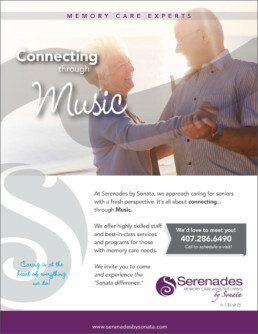 Call a Sonata Serenades community near you today or schedule a visit ? Feel free to contact us at 407-286-6490.